You may have noticed the rapid rise in barbell use and serious lifting with many fitness enthusiasts over the last few years? Spurred on initially by the popularity of crossfit, the sport of Olympic Lifting, which was previously only seen once every 4 years at the Olympics Games, quickly became common place in many health clubs. More recently, the sport of Power Lifting has also seen resurgence, with many recreational lifters now competing in the sport and focused intently on improving their numbers in the ‘Big 3’ - the squat, deadlift and bench press. While the sport of Olympic Lifting requires you to select your parents correctly due to the very specific positional demands required to compete, Power Lifting does not have these same needs. In fact the range of motion required to compete in the sport of Power Lifting is well within reach for most people. You may have got this far and be scratching your head, asking…. For some of the movements discussed above, footwear can have everything to do with them. Whether you should head to the bar barefoot or not isn’t always a straightforward answer, let’s explore!So why do we regularly see people on platforms and standing next to squat cages shoeless? The main reason given for removing shoes is so someone can lift more, and the reason why they claim this is a person lifting with traditional running shoes will ‘leak’ force through the cushioned part of the shoe. As the sole of the shoe compresses, the lifter will not be able to drive their feet into the floor as hard and as a result energy will be lost. The removal of shoes when performing a deadlift will also take the lifter closer to the ground, meaning the bar doesn’t have to travel as far to get to the point of lockout. Based on the points above you will notice many serious Power Lifters will perform this movement with a hard soled shoe such as a Converse Chuck Taylor, or a very flat soled shoe such as a Dunlop Volley. Both shoes minimise the leaking of energy as we have previously mentioned. As someone who spends a lot of time in commercial health clubs I must recommend you wear a form of fully enclosed shoe at all times, both the options mentioned above are low cost and you may even already have a pair sitting at the bottom of the cupboard. So where do Olympic Lifting shoes fit into this picture? You may have seen these on some members or when out shopping for new gym gear, as the availability of lifting shoes has increased dramatically over the last 5 years. If you did pick your parents correctly and you can achieve FULL depth in the squat (your hamstring and calf muscles entirely cover each other as you completely close the knee joint) then congratulations, your career as an Olympic Lifter may still be attainable. If you are like me however and you have restrictions, previous injuries or simply cannot achieve this level of depth, then lifting shoes may be a good option. Even if you did pick the correct parents, a lifting shoe can help provide greater stability across the entire base of your foot, due to the additional width of the shoe. For those of us with restrictions or previous injuries, achieving full depth in the bottom position of the squat is not as simple as it sounds. Getting to that depth while not folding forward at the hips (maintaining an upright torso) and simultaneously maintaining the natural lumbar curve requires adequate mobility at the ankle, hips and thoracic spine. This position is simply out of the reach of many recreational lifters due to the volume of time we all spend desk bound. Lifting shoes can reduce the range of motion required at the ankle therefore making the bottom position more attainable for more people, this is the same reason you will see some people place plates or blocks under their heels with squatting. 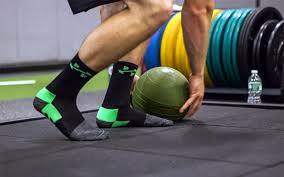 Should you or shouldn’t you go for the shoeless look at the bar is not as simple as a yes and no answer and I encourage you to speak to a Personal Trainer in your local club for some specific advice based on the goals you are trying to achieve and your own movement capability.